Paul Koenig's D-Day: The Canadian Beach társasjáték - Magyarország társasjáték keresője! A társasjáték érték! A Paul Koenig's D-Day: The Canadian Beach egy remek társasjáték, 2 játékos részére, az átlagos játékidő rövidebb, csak 50 perc. A játékmenet erősen épít a "hex-and-counter" rendszer és a "chit-pull" rendszer mechanizmusokra. 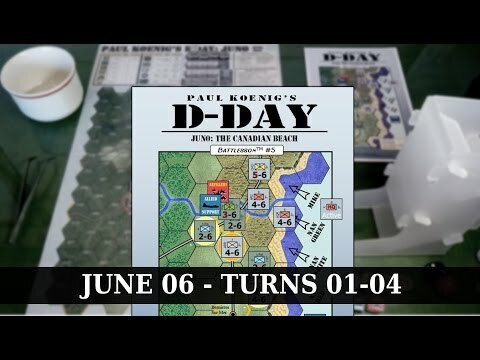 Juno: The Canadian Beach is the first game in the Paul Koenig’s D-Day series of five titles covering the first three nail-biting days (June 6 – 9, 1944) of Allied landings in France to liberate Europe during World War 2. Using fluid and dynamic systems for integrating the fierce combat and rapid movements of the companies and battalions contesting the beaches, cliffs, swamps and bocage bordering the rough North Sea coast, players will find the easy rules to offer rich puzzles and surprising opportunities on the cross-map march to victory. Can the Canadian 3rd Division find sufficient air, naval, and artillery support to clear Juno Beach and advance inland through the bocage country to the south and link up with the British beaches to the east? Or will the German defenders of the 716th Division react in time, bringing up their anti-tank assets to stop the Canadians on the beaches as they did at Dieppe two years earlier? The German commander, Erwin Rommel, planned to stop the invasion on the beaches… and it nearly happened! Part of a 5 game series! Game Scale: Each unit is 1 company to regiment, each hex is 1 kilometer, and each turn is about 4.5 hours.